Unless you're an inveterate walker or a mass-transit rider, you probably spend more time in your car each week than anywhere except your workplace and your home. It's not always pleasant. Highway gridlock, a fruitless search for a parking space or a brush with a thundering tractor-trailer can rattle all but the most Zen drivers. Fully self-driving cars remain some years away. But new technology in the next five to 10 years will help cars park themselves, monitor the alertness of the driver and even communicate with each other to avoid collisions. Tomorrow's cars may have long-range headlights, external airbags and hydrogen fuel-cell engines that emit only water. 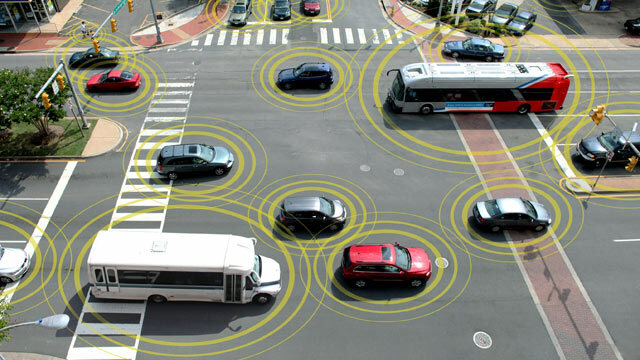 With this project, CNN is honoring 10 innovations in automotive tech. Some of these may gain traction quickly, while others may spin their wheels in the marketplace. But all have the potential to change how we drive – in a good way. May we present the CNN 10: Future of driving. Thanks to on-board computers that operate everything from the stereo and navigation to the brakes and accelerator, the era of "big data" is coming to the automobile. Like their deskbound brethren, these rolling computers produce an enormous amount of data – mostly about people's behavior behind the wheel – that can be analyzed to spot trends and fight inefficiencies. And thanks to this data, your car may soon know where you want to go before you even pull out of the driveway. Mercedes-Benz is developing a system that over time promises to learn your schedule, tastes and even your moods. For example, it knows that you leave the house every weekday at 7:30 a.m. to take your kids to school and that you like the cabin a toasty 75 degrees. Based on GPS and satellite data, it quickly learns your preferred routes and tracks real-time traffic problems, so it can suggest detours to help you save time. The car can even tune the radio to the Disney channel until you drop off the kids, at which time it will recommend NPR. In the afternoons, it knows you usually prefer hip-hop. "It's almost like the car's becoming aware," says M. Bart Herring, general manager for products for Mercedes-Benz. "Because it can make really smart decisions." Ford has developed a system for its hybrid cars that tracks where and how an owner drives each day to maximize fuel economy. That data can be used to alter how the hybrid system behaves -- when the gasoline engine comes on to generate power, and when the car runs on electricity only -- to get the most driving range. For example, if your car recognizes you're almost home, it will switch over to electric power knowing you'll soon be able to recharge the battery. This all happens without the driver having to punch in a destination on the car's GPS. The car will simply have learned that when you get in your car at 8 a.m. on a Tuesday you are almost certainly about to take the same route you take every Tuesday at that time. Of course, all this data about motorists' whereabouts raises concerns about privacy, especially if automakers were to sell that data to marketers. A report last month by the Government Accountability Office found that carmakers do not appear to be sharing any location data that would personally identify drivers, although the automakers' privacy practices remain confusing. Meanwhile, many new vehicle models today have sensors connected to the pedals and steering wheel that detect exactly what you're doing with those controls, while separate sensors connected to the wheels and engine detect what the car is doing in response. That information is stored in an event data recorder, sometimes called a "black box." It's different from a "black box" in an airliner because it doesn't record the car's position or conversations inside the passenger compartment. But it is continually recording everything the driver does with the controls. In the event of a crash, it stops recording and preserves that last few seconds of activity. With a court order, police, attorneys and insurance companies can collect that data to see whether a driver was speeding or failed to take evasive action to avoid a wreck. Progressive, the insurance company, has found that how you use your brakes -- specifically, whether you tend to make short, sudden stops or longer, gentle ones -- can be an excellent predictor of whether you're likely to file insurance claims. So, the next time you buy a new car, remember: While you're getting to know how your new ride handles itself on the road, your car is also getting to know you. For several years now, we've been hearing about a near future in which all of our digital devices communicate with each other. Your fridge notices that you're at the grocery store, for example, and sends a message to your phone saying you're out of milk. Or your oven texts you when the pot roast is done. Now this so-called "Internet of things" is coming to the highway. As cars grow more and more computerized, they will be able to trade messages about traffic, weather and road conditions. More urgently, they can broadcast their speed and direction and warn each other about potential safety hazards, such as when a nearby vehicle is drifting into your lane. "If I can get information from the car next to me that they're going to turn right, that would be great," explains Maarten Sierhuis, director of Nissan's research center in Silicon Valley. He imagines a day when information about almost all vehicles is stored in the cloud and accessible by all. "It would be like crowdsourcing the driving experience." This technology is called vehicle-to-vehicle communications, or V2V for short, and it's not far off. In the first test of its kind, almost 3,000 cars and trucks equipped with prototype V2V devices have been driving around Ann Arbor, Michigan, over the past year-and-a-half as part of a pilot program by the University of Michigan and the U.S. Department of Transportation. The devices emit a short-range safety signal 10 times per second and can detect signals from other vehicles to determine when a potential accident is imminent. Cars equipped with the devices emit beeps when they detect potential hazards such as another vehicle entering an intersection, a pedestrian, a patch of ice or even their driver speeding too fast around a curve. Researchers are still crunching the data, so it may be too soon to say whether Ann Arbor's network of connected cars made its streets safer. But federal transportation officials are already sold on the technology, which they estimate could prevent 76% of the crashes on U.S. roads. Earlier this month, the National Highway Traffic Safety Administration announced it will move forward with plans to require V2V technology on all cars and light trucks, possibly as early as 2017. The tech would come standard on all new vehicles and could easily be added to older ones as well. "V2V crash avoidance technology has game-changing potential to significantly reduce the number of crashes, injuries and deaths on our nation's roads," says NHTSA Acting Administrator David Friedman. "Decades from now, it's likely we'll look back at this time period as one in which the historical arc of transportation safety considerably changed for the better." This V2V technology would only send warnings to drivers. But future systems could automatically take over braking or steering if they sensed an imminent collision, federal officials say. Carmakers also are experimenting with other methods of warning drivers of impending dangers, such as vibrating steering wheels. We humans are flawed drivers. We sometimes get behind the wheel while sleepy or even drunk, and we're easily distracted, whether by our electronic devices or something pretty outside our window. In the gravest circumstances, we can even have a stroke or heart attack behind the wheel. This is why researchers, app developers and car companies are developing technology to monitor flesh-and-blood drivers and help them avoid accidents. Advanced sensors in the passenger cabin can monitor a driver's vitals such as heart rate, eye movements and brain activity to detect everything from sleepiness to a heart attack. 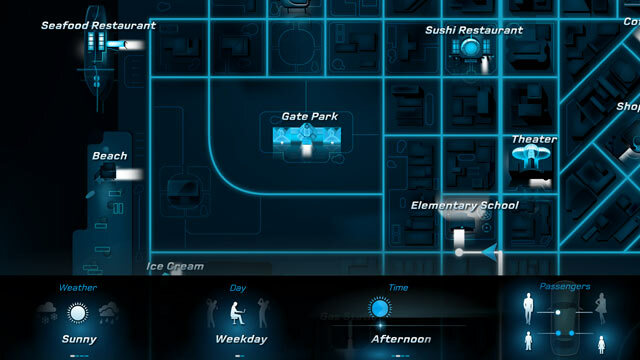 Nissan is experimenting with an array of technology that detects drunken driving. A sensor in the transmission shift knob can measure the level of alcohol in a driver's sweat, while the car's navigation system can sound an alarm if it detects erratic driving, such as weaving across lanes. The University of Leicester is working on a system that aims LED lights at the driver to track their eye movements and determine if they are paying attention to the road. But even awake and alert drivers can get distracted. Audi is testing an attention guard that uses cameras to monitor the driver's head position. 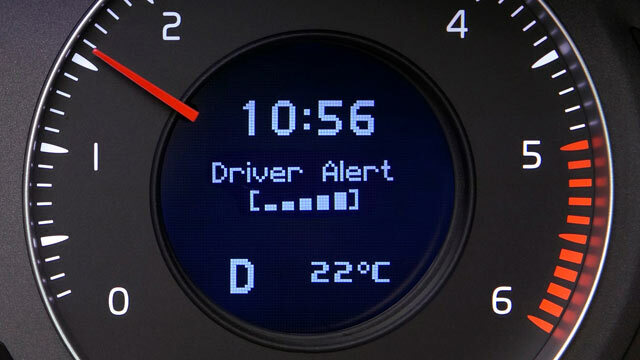 If a driver looks away from the road for too long and the car's sensors see it is coming up on another vehicle, the car will sound an alarm and even slow down to prevent a collision. 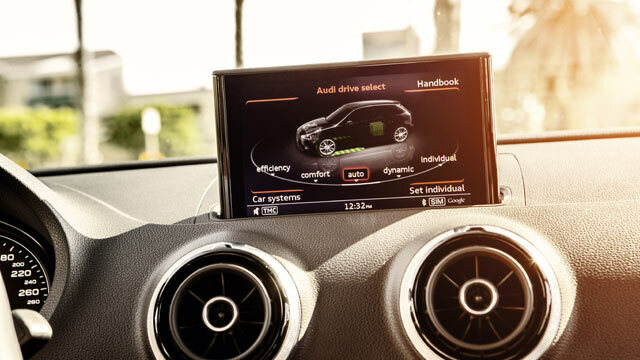 "The overall objective is to keep you safe, to keep you moving," says Mohan Trivedi, director of UC San Diego's lab for intelligent and safe automobiles, who has worked with Audi on the technology. "One of the other things is a stress-free, enjoyable ride for the driver." Then there are systems that use sensors to keep tabs on a driver's health. Ford has teamed up with health-tech companies on a glucose reader that alerts diabetic drivers when their blood-sugar level drops. Ford also has developed external sensors that can detect high pollen counts and monitor an asthmatic's breathing. At the Nippon Medical School in Japan, researchers are testing electrocardiograph sensors in the steering wheel that can pick up early signs that a driver is having a heart attack. It will be a few years before most of these technologies appear inside production vehicles. But third-party apps on phones and wearable devices, such as fitness bands and Google's Glass eyewear, could become commonplace much sooner. For example, DriveSafe is a Google Glass app that uses the headset's built-in accelerometer to detect when a driver's head falls. It also employs infrared sensors to count eye blinks and can sound an alarm if it detects the driver is falling asleep. All this monitoring technology may seem creepy to people who are sensitive to digital privacy. And the potential exists for annoying false alarms. But if it works properly it could make our cars, and highways, safer. For decades, inflatable airbags have been protecting people in cars from the devastating jolt of collisions. There are airbags mounted in the dash, steering wheel, side panels, seats and even seat belts. Despite their varied locations, these airbags all have one thing in common: They're inside the vehicle. But what if someone made airbags that inflated on the outside to help protect the car -- and pedestrians -- before the moment of impact? TRW Automotive, a maker of safety technologies, is developing a large airbag that would fit into rocker panels on the side of the vehicle, on the beam below the doors. A system of cameras and radar on the car would detect when a collision was imminent and send a signal to the airbag, which would inflate outward and upward within 30 milliseconds. In this way, the side airbag would absorb some of the energy of the collision before the vehicle's frame was struck. Crash tests have shown that the external airbags can reduce the impact on a vehicle's interior – the inward crumpling of a car's frame and doors – by up to 35%, said Emiliano Core, who is developing the airbag system along with Lothar Zink and other TRW engineers. Collisions to the sides of vehicles, which offer less protection than the front or rear, account for about one-third of traffic fatalities in the U.S., he said. The airbag system is still in the concept phase, and there's no timetable for when it might be ready for mass production. But "we have at least one carmaker who is interested" in the technology, Core said. Other external airbags also are in the works. TRW has developed an airbag that would deploy from the trailing edge of a vehicle's hood, spread over the windshield and cushion the impact for pedestrians struck by cars. Volvo has installed similar airbags in its V40 hatchback sedan. 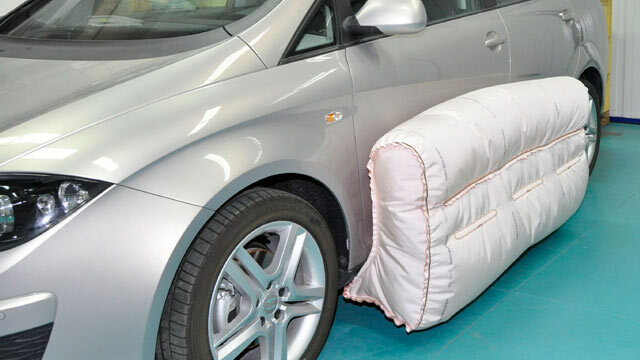 And Mercedes-Benz has developed an airbag that inflates underneath a car and acts as an anchor by rubbing the road surface, slowing the vehicle down. Of course, these airbags all are last-ditch safety features. Ideally, the sensors on today's computerized cars would detect an obstacle or a pedestrian and apply the brakes to avoid a collision. But if they don't, it's good to know your car might someday offer another pillowy layer of protection. At last, the future is now. Hydrogen fuel cell-powered automobiles, a form of transportation that was often said to be perpetually five years away, are finally hitting showrooms next year, with Toyota, Honda and Hyundai rolling out models. It's been a long time coming, says Scott Samuelsen, director of the National Fuel Cell Research Center at the University of California, Irvine. "The auto companies have been evaluating different models since 2002," he said. Toyota and Honda have been testing cars in the United States, and other manufacturers, including Hyundai, GM and Mercedes, have been working on the technology. 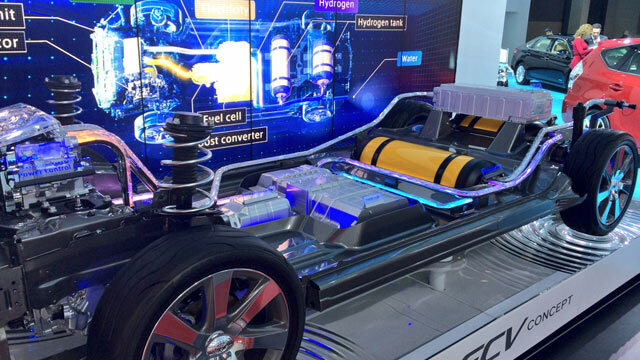 Hydrogen fuel cells offer some key benefits over competing technologies such as all-electric lithium-ion batteries and the traditional internal-combustion engine. Unlike lithium-ion batteries, found in such vehicles as the Tesla Model S and Nissan Leaf, hydrogen fuel cells are capable of long-range driving – 400 miles, according to Samuelsen – and can be recharged in a matter of minutes. And unlike gasoline or diesel engines, fuel cells are environmentally friendly, with water their only byproduct. But fuel cells have other challenges: mainly a lack of hydrogen filling stations. California currently has just 25 stations, with a goal of 68 by 2016. That may be enough to allow people to drive their cars between Los Angeles and San Francisco but won't be much help if they're going out of state. There are also limitations that affect batteries, such as poor performance in cold climates. And the batteries' sheer bulk makes for more limited trunk space than their gasoline-fueled brethren. But those issues are being overcome, say automakers. "All the performance metrics and all the driving dynamics are very similar to a gasoline car. There's no compromise for the customer," said Craig Scott, advance technology vehicle national manager for Toyota. The Japanese-based automaker is releasing the Toyota FCV in 2015. And Steve Ellis, Honda's manager of fuel-cell vehicle marketing, believes the technology is only getting better. Honda's FCX Clarity has been on the market since 2008, though only for lease in America. Honda's new vehicle, yet unnamed, is due sometime in 2015. "(The new car) has a 60% improvement in energy density coming from the fuel cell stack, with a 33% size reduction" compared with the FCX Clarity, Ellis said. "It really demonstrates how significant the advances are." The word "hydrogen" conjures frightening images of exploding blimps. But industry experts say the fuel cells are rugged and thoroughly tested. Samuelsen was even broadsided in a hydrogen vehicle, "and I'm still talking to you," he said. Samuelsen and Ellis believe that fuel cell cars will expand, not cannibalize, the current market for hybrids. After all, conservation trends suggest we'll all be relying more on alternative fuels in the future. Right now, the most advanced computers in cars are on the devices many drivers already have in their pockets when they get behind the wheel. Smartphones and tablets have outpaced the in-car dashboard computer, thanks to quicker development times and more user-friendly interfaces. Now car companies are working hard to catch up. The next generation of dashboard touchscreens, dubbed "infotainment" systems by the carmakers, are already showing up in commercially available vehicles. As Consumer Reports noted this month, these systems can frustrate motorists when they're buggy or overly complicated. This is one reason why carmakers are now approaching them like intuitive, app-laded smartphones. Chevrolet's MyLink is developing an in-car app store where drivers can get familiar tools such as social-location app Glympse, streaming-music app iHeartRadio and others. 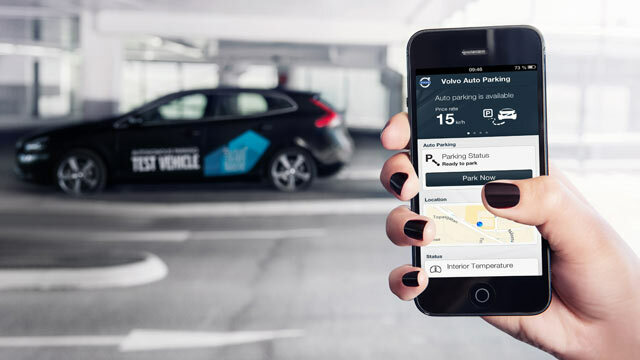 And Volvo's Sensus Connected Touch system goes beyond the usual entertainment offerings to offer historical and cultural information about passing landmarks while turning the car into a Wi-Fi hotspot and a mobile-payment system for parking lots. At first glance, dashboard touchscreens might seem like a safety hazard to drivers already tempted to peer at their phones. But one argument for these in-car systems is that they can actually cut down on distracted driving by controlling what the driver can and cannot do while in motion. These computer screens can even help manage a driver's attention by shutting down nonessential features and sounding messages to refocus the driver on the road. Today's vehicles also are marrying dashboard touchscreens with heads-up displays that beam speed, traffic and navigation info onto the windshield, directly in the driver's line of sight. Again, this helps keep the driver's eyes on the road instead of the dashboard or, worse, their phone. In-car systems are increasingly engineered to work with smartphones and tablets. Chevy, Honda and other carmakers have partnered with Apple to equip cars with an eyes-free mode for Siri, the voice assistant on the iPhone. The system lets drivers tell Siri to send messages, create calendar events or activate turn-by-turn navigation, all without having to fumble with their phone. And Google has teamed up with GM, Audi, Honda, Hyundai and other carmakers to bring its popular Android operating system to car dashboards by the end of the year. Next up are in-car apps that follow you seamlessly to your mobile device once you exit a vehicle. BMW's i3 concept car is compatible with the Samsung Galaxy Gear smartwatch, while Mercedes is working on an app for the Pebble smartwatch that feeds the wearer such relevant info as their car's location in a parking garage. Now, automakers are pioneering a generation of "smart" headlights that can automatically adjust their brightness or direction depending on conditions. And a coming wave of laser high beams promises to illuminate the road ahead for a third of a mile – twice the range of LED high-beam headlights – while using less energy. 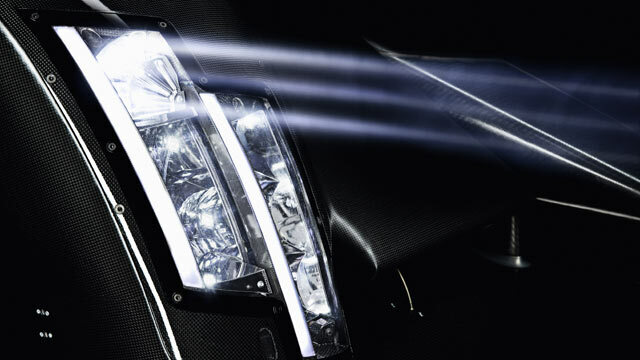 "We'll be able to extend the range of headlights to (a distance of) six football fields," said Filip Brabec, director of product management for Audi. That's 600 yards, or more than three north-south blocks in New York. If you believe the hype, it would seem that self-driving cars are right around the corner. Google has been testing them for several years, and states like California and Nevada have authorized them for use on roads – although only with a human behind the wheel. Autonomous-driving features, such as systems that recognize hazards and brake on their own to avoid collisions, are already on the market. But the fantasy of a car that automatically steers you to work while you read the morning paper or catch a few extra Zs is still many years away. "Autonomous driving is not going to mean jump in the car, push a button, say 'Take me to grandma's house' and go to sleep,' " said James Bell, head of consumer affairs for GM. "That may come someday, but not soon." It is coming, though. Automakers and universities are laying important groundwork for the technology now by testing automated systems, working with regulators and earning the trust of drivers who are uncomfortable handing over the wheel to a computer. Autonomous cars could save energy, cut down on accidents and ease traffic congestion by traveling at uniform speeds. But even if the cars can vastly improve driver safety, the technology still faces some tricky balancing acts. Before fully automated cars can relieve us from driving forever, manufacturers and researchers must work with governments to establish standards and laws – a challenge that may prove more difficult than any algorithm. The technology works by outfitting cars with an array of sensors, cameras and radar systems, then applying artificial intelligence to help the cars know where to go. The vehicles must gather large amounts of information about surrounding obstacles, calculate risks and make split-second decisions about what to avoid -- and even the best way to crash if necessary. Automakers already are rolling out assisted-driving features that help take over tasks such as parallel parking or navigating stop-and-go traffic. Audi is testing a feature that can take command during an emergency to prevent a crash, but it's still a far cry from fully automated driving. "Is the car taking over? No," said Filip Brabec, director of product management for Audi. "We make it very clear to the driver that you have to keep on driving. This is just a support function. You can definitely override it." 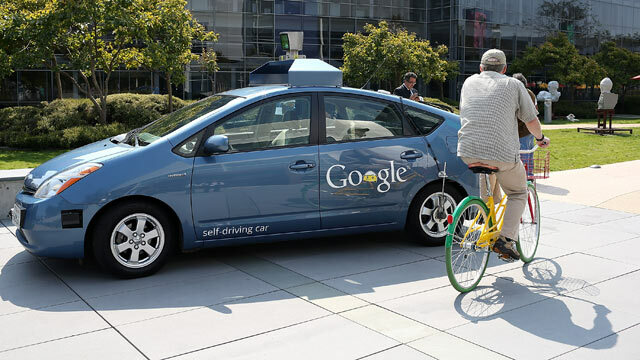 Google has received the most attention for its early forays into driverless vehicles. The tech giant is testing its own cars on 60 acres in California's Central Valley. And almost every major car manufacturer is collaborating with universities, and even among themselves, to develop automated-driving technology. The real test will come when self-driving cars finally hit the market. Will wary consumers steer clear? Or will motorists, weary of stressful commutes, embrace them as computerized chauffeurs? "People will maybe be a little slow to trust (the cars) initially. Then they'll be a little fast to trust the cars too quickly," said Stanford engineer J. Christian Gerdes, who worked with a team of graduate students on an automated race car. "I think neither is really deserved." That's one reason carmakers have been busy for years adding parking-assist features that help drivers squeeze into and out of tight spots. Cameras and sensors mounted in car bumpers measure the distance between the car and surrounding obstacles, allowing a semi-automated system to turn the steering wheel, move and brake to navigate into spaces. The driver typically still has to perform some functions, however, such as shifting between forward and reverse. Next up are cars that can park themselves at the push of a button. Engineers with Ford's European division have developed a system that can search for a parking space and pull into it, without the driver even being in the car, a potential benefit in tight spaces where it's hard to open your car doors. Audi and Volvo have demoed similar technology. It might be a while before fully autonomous parking comes to production vehicles. In Europe, laws prohibit motorists from leaving the engine running with nobody in the driver's seat. And in the U.S., only four states allow autonomous cars on public roads, and then only when a driver is behind the wheel. Determining liability in fender-benders involving self-parking cars could be complicated. And the technology still needs to be fine-tuned before it's 100% reliable and drivers will trust it. "Every parking garage is a little different," explained Maarten Sierhuis, director of Nissan's research center in Silicon Valley, on the challenges of designing self-parking systems. "Automated parking seems like a relatively easy next step. But it's not." The dream, of course, is vehicles that run on renewable energy, like sunlight. And that dream is a little closer to reality now, thanks to an invention that works like a giant magnifying glass to beam the sun's power into a car. Researchers at Georgia Tech have teamed up with Ford Motor Company to build a concept hybrid car that would move its driver closer to being off the grid. Instead of hooking the car up to a traditional charging station, you would park the C-Max Solar Energi Concept car under a special concentrator that magnifies the sun's rays. The result? A day's worth of sunlight produces a range of up to 620 miles, Ford says. "Electric cars and plug-in hybrid electrics are a step forward, but if you charge on Chinese, pure-coal power grids, you're still not quite getting the benefit," said Bert Bras, a professor at Georgia Tech's George W. Woodruff School of Mechanical Engineering. "If we can get actually clean electricity into cars -- then you're really getting there." Cars that run some functions on solar power aren't new. But current systems can't beam power from the sun into cars fast enough for the technology to be really useful. 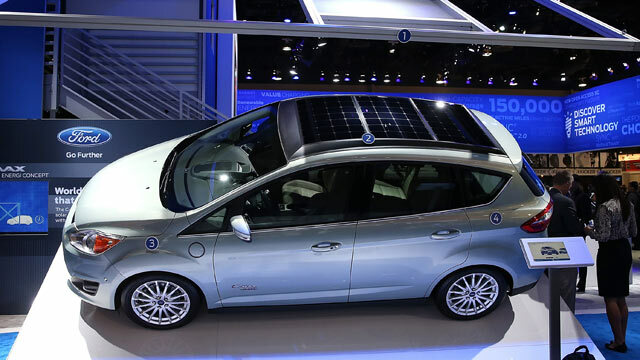 The C-Max Concept couples 5-foot-wide solar panels on the car's roof with an acrylic canopy designed to capture and intensify the sun's rays. Think of it as a combination carport-magnifying glass. The canopy's magnifier actually tracks the sun's brightest rays throughout the day, moving with the sun's position to soak up the most energy possible. "It's 174 petawatts of solar that hits our Earth every single day," said Mike Tinskey, Ford's global director for electric vehicles. "It's just an amazing amount of power, and this is just one way to start harvesting some of that power and using it for transportation." Bras and his team plan to begin testing the C-Max Solar in and around Atlanta in the coming months. But it's unclear when this kind of solar technology could be ready for the market. Automakers like Ford and Toyota are relatively new to solar power, and it's also unclear whether they or another manufacturer would pony up the big bucks it would take to make such a revolutionary approach mainstream. "How far is it away?" Bras said. "If somebody started getting crazy about it, it could be a couple of years." CNN’s new focus on innovation culminates with our 10 Ideas of the Year, celebrating bold thinking in technology and related fields. These are the game-changing concepts that will improve our world and shape our future. CNN highlights 10 of our favorite thinkers in science and technology whose ideas are shaping our future. These are people who have shoved conventional wisdom aside and are changing the world with their insights and innovations. In garages and laboratories around the world, inventors have cooked up prototypes of audacious new gadgets. Some are becoming viable consumer products, while others may never get beyond the test phase. Here are 10 of our favorites.